Accurate diagnosis is essential to ensure the most effective treatment. A second opinion requires only that your doctor send your slides to us. No additional surgery is necessary. What Happens to Your Slides in Pathology? - Learn about what happens when you send slides to Pathology for a second opinion. While pathologists do not directly treat patients, they play a critical role in research, diagnosis and treatment. Pathologists are crucial for accurate diagnosis and therefore appropriate treatment of diseases. The pathologists examine small samples of tissue under microscopes to identify whether tumors are benign or malignant and the type of growth. What Happens to your Tissue Specimen in Pathology? 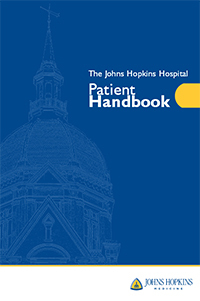 - Learn about what happens to your tissue specimen in Pathology as a patient at Johns Hopkins. Several experts in the department have developed patient education web sites about the diseases that they research. Learn about the newest research and treatments for your disease. Several experts in the department have put together questions and answers about pathology reports for various specialties. Learn more about your pathology report in detail.